Our egg-layers—an ever-changing mixture of good foraging breeds such as Red Stars, Amber Links, and Isa Browns—are rotated through our 35-acres half an acre at a time, enclosed by electric fence for predator protection when needed. They roost in a high tunnel during the colder parts of the year, maintaining access to several adjacent acres. (Sometimes they venture out a bit farther if they catch a ride on the back of a sheep.) We supplement their foraged diet with local, non-GMO grains. Generally speaking, all of our eggs are sold less than one week from their lay date. Sheep first came to the farm as a way to build soil fertility; we simply borrowed a neighbors flock to graze them on our land. It was a lot of work, but a good way to build up the soil fertility after buying the land from conventional corn/soybean producers. After a couple of years we started building our own flock and now have about 80 lambing ewes each year. 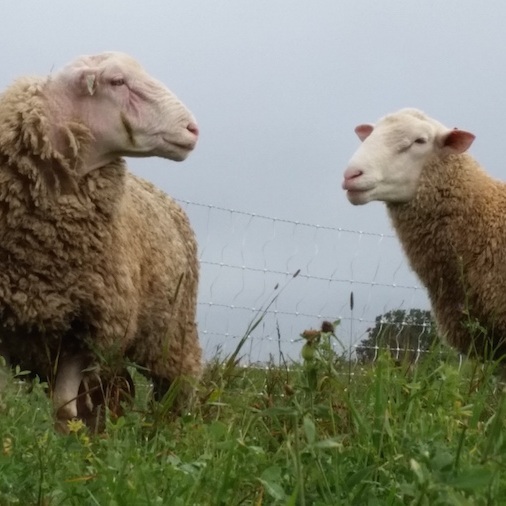 Using a rotational grazing system with small paddocks (~½ acre) and frequent moves (twice/day), the diverse forage plants are eaten by the sheep, but also sufficiently trampled in a way that encourages fertility, regrowth, and biodiversity. The frequent movement also manages chronic sheep parasites, which otherwise have to be treated with wormicides. Our lambs are 100% pasture-fed and we process them between 9 months and 2 years. Older animals (hoggest or mutton) are incredibly flavorful and also available upon request. Tamworth piglets catching shade in the barn. We have been raising hogs on our farm for four seasons. 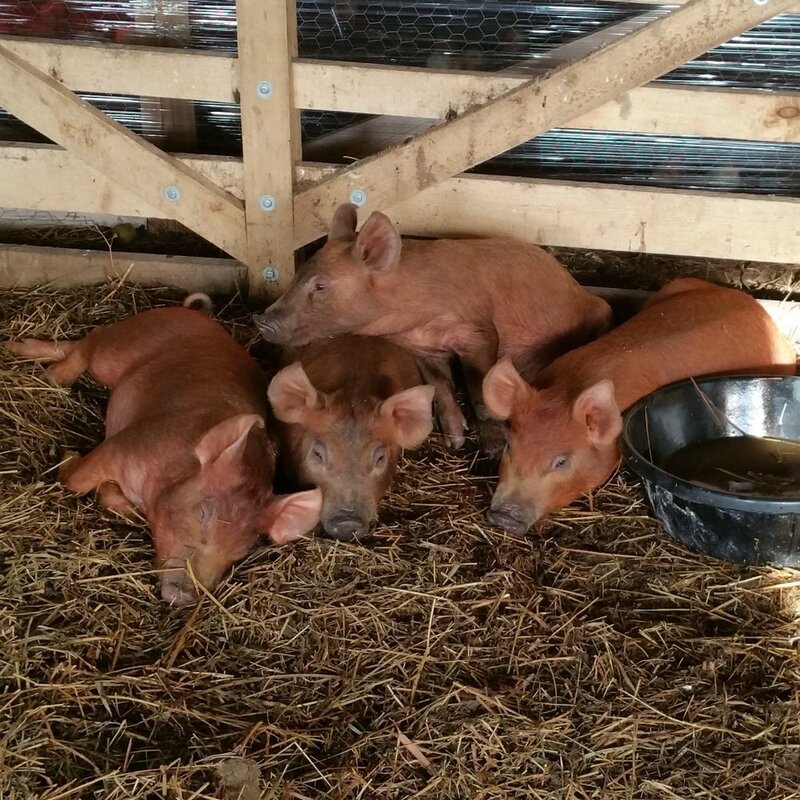 We buy piglets in the Spring from Esch Farm in Dexter, Michigan. They raise a variety of heritage breeds including Tamworth and Chinese Poland. We raise the hogs on pasture, where the root and wallow and turn the soil, and supplement their feed with local, non-GMO grain from a nearby mill. They have access to a spray of cool water and shade in the hot summer weather. We only raise a precious few hogs each year, so put yourself on the waitlist if you are interested in one for next Fall. Our superior broiler chickens were our flagship product and gained us some of our most loyal customers. While the overwhelming majority of chickens in the US raised for meat are the massively-breasted Cornish Cross breed, we raise Freedom Rangers instead, developed for pastured production and well-known for their superior texture and flavor. About 20% of our birds’ diet is foraged and the other 80% is locally-sourced non-GMO grains and soybeans. We use “Salatin-style” chicken tractors for the meat birds, moved to fresh pasture twice daily. Unique among local producers, we do all of our processing ourselves, on-farm, on a mobile field processing unit, and sell the birds fresh (not frozen) the day after slaughter and butcher. The heritage breeds we bought from an Amish farm in Ohio take more than six months to raise—roughly twice as long as conventional breeds—making them quite an undertaking. But the results are worth it and we look forward to raising the again in the future. Our 20-bird flock in 2015 was a sight to behold as it ranged our 35-acres. We don’t have plans for Turkeys in 2019, but will post updates if we raise some in 2020.